Founded in 1997, Julie & Company provides a comprehensive line of creative services. We specialize in developing effective logos and corporate branding, and have also developed over 250 websites for clients in a wide range of industries. Our services include brochure design, advertising, direct mail, project sheets, pocket folders, giveaways, product packaging, trade show booths, and more. If you need to promote your organization, Julie & Company can help. Lots of people now think they can be web designers and make a killing. I dated a shmoe last year who had never designed a thing in his life. He decided that he, too, could become rich if he only bought a web design franchise and a book about sales. God help the person who actually hires him because he doesn't know a thing. I get emails and phone calls multiple times a day asking if I hire freelance designers. Sorry, kids, I don't. I've been ripped off by two people who have failed to pay me after I did a small amount of work. We're not talking about a lot of money, but when you put the two of them together, it's almost $1000. I could use that $1000 about now. My brother was laid off a couple of weeks ago after working for 25 years at the same company. He thought he'd retire there but now he's on the street. Scary times. I guess the bottom line is that I should take George Harrison's advice and recognize that all things must pass - including these bad economic times. 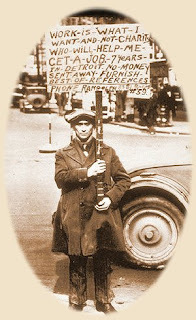 I just know that if one more financial pundit questions whether we're in a recession, I'm going to go postal. This includes my financially astute father who insists that since he is making so much money, there must be something wrong with me. Now it's time for an affirmation: I am rich, debt-free, and have more money than I'll ever need. Amen.